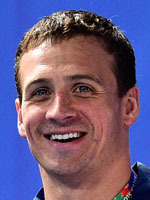 At 32 years of age, Ryan Lochte has amassed a remarkable collection of medals. The American is a 5-time Olympic champion and a 39-time world champion (long and short course). His record would no doubt be even more impressive were it not for the sheer dominance of his rival Michael Phelps. Lochte took gold in the 400m medley and the 4x200m freestyle at London 2012, and in Rio he will be looking to add to his haul of 11 Olympic medals (5 gold, 3 silver, 3 bronze). A versatile champion, boasting world titles in medley, backstroke and 200m freestyle, he is one of just 2 swimmers, along with Australia's Grant Hackett, to have won the same event at 4 consecutive world championships: the 200m medley, between 2009 and 2015.